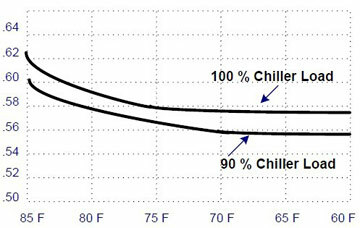 The temperature of the water sent to the chiller condenser from the cooling tower is determined, largely by the ambient wet bulb temperature and the efficiency of the cooling tower (the amount of air drawn through the tower and the efficiency of air-water contact). The cooling tower is specified to meet the design wet bulb temperature in any geographic area -- commonly 75° to 78°F. The cooling tower manufacturer then designs the tower to produce 85°F water under this condition for the design heat rejection level and water flow. The temperature difference between the water sent to the condenser (i.e. coming off the cooling tower) and this wet bulb figure (say 78°F) is defined as the approach temperature 7°F (= 85 - 78). This design day wet bulb condition occurs relatively few hours a year. During dryer times, the cooling tower can produce colder water than 85°F. 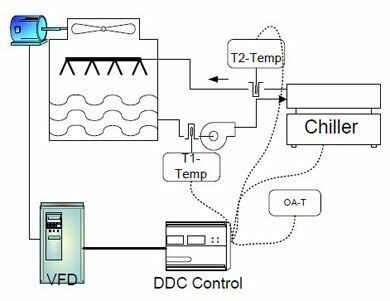 And, most chillers will operate with reduced power input if this water temperature is reduced (down to a given limit as specified by the equipment manufacturer). This concept is called "floating the condenser" and holds the potential of conserving energy and reducing operating costs. Most of the energy consumed buy a chiller is used to move refrigerant from low pressure evaporator to high pressure condenser. As the pressure difference between the condenser and evaporator increases the compressor must do more work to move the refrigerant. Lowering the condenser water temperature decreases the pressure difference and the chiller does less work. Cooling tower controls by frequency converters are usually set to produce water at 85 deg F. When ambient conditions are appropriate, the controls can be reset to produce water that is cooler than 85 deg F. Depending on the chiller manufacturer, it may be possible to lower the leaving water temperature to 65 deg F  saving considerable energy. There is a trade-off. In order to achieve the lower temperatures the cooling tower fan will run longer and harder. Therefore, the cooling tower fan can use up nearly 50% of the energy savings realized by the chiller. Using frequency converter on the cooling tower fan provides better control and reduces the loss of potential energy savings.